Donation quilt, 45 x 45", ready for the binding to be sewn down. I definitely did okay at the guild fabric swap. I took 16-3/8 yards to give away and only brought home 12-1/8 yards. 1. 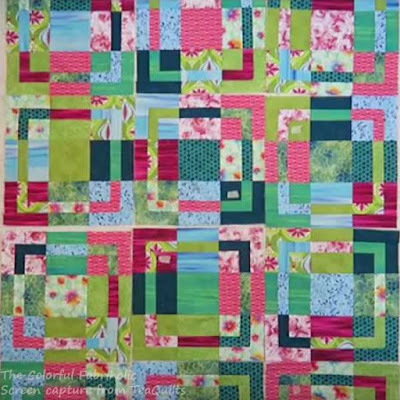 Keep up with Pat Sloan Solstice Challenge blocks. Yes, with modifications to suit me. 2. 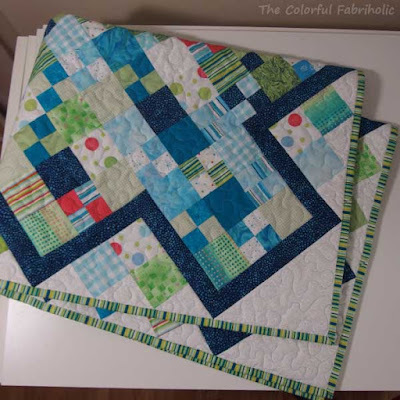 Finish Boomerang Patches baby quilt into a flimsy. Done - not only a flimsy but quilted and bound. 3. 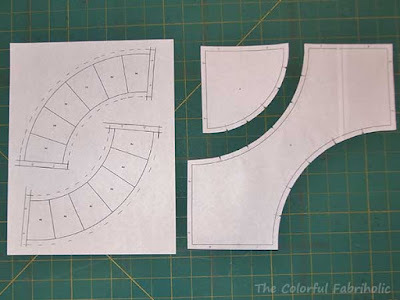 Cut pieces & paper-piece arcs for more snake blocks for next sew day at Kevin's. 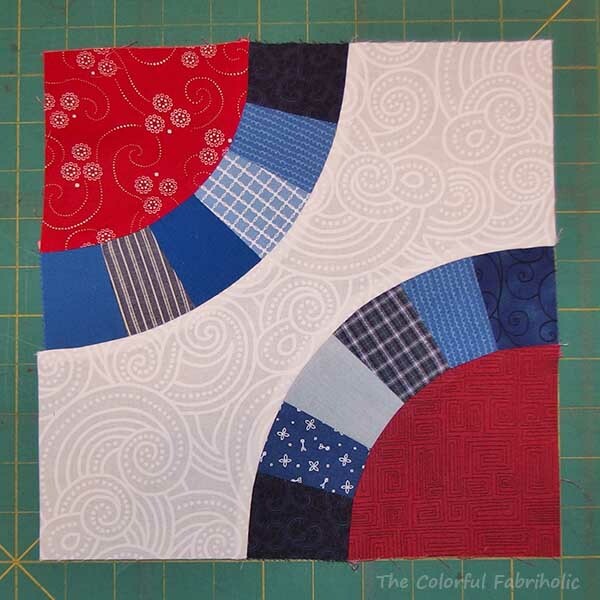 Cut more blue pieces and made one complete snake block. Still need to make more arcs. 4. Make progress on Roman Road WIP. Not touched. Instead, finished a small donation quilt that was a UFO. 5. Make progress hand piecing my Piecing Group project. Yes - finished sewing top borders on and started pressing all the sections returned by Piecing Group members. 6. Keep up with bee blocks. Done. 1. 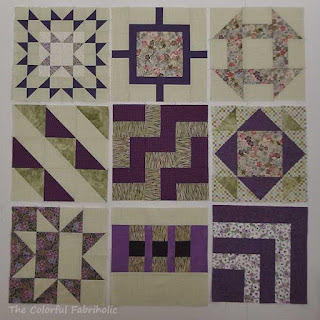 Keep up with Pat Sloan Solstice Challenge blocks. 3. Start planning a 12 Days of Christmas in July project requested by my son. 4. Make progress on Roman Road WIP. 5. 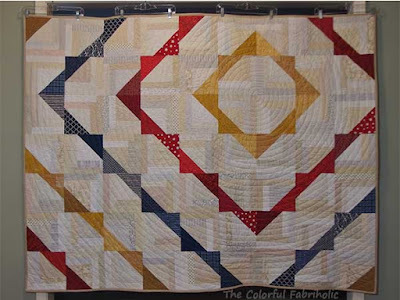 Make progress hand piecing my WIVSP* Piecing Group project. I stitched in the ditch around the dark blue border, and quilted it with an allover large meander using light turquoise thread on the front and white on the back. Lately I've been applying binding to the back first, then glue-basting and stitching it down to the front. 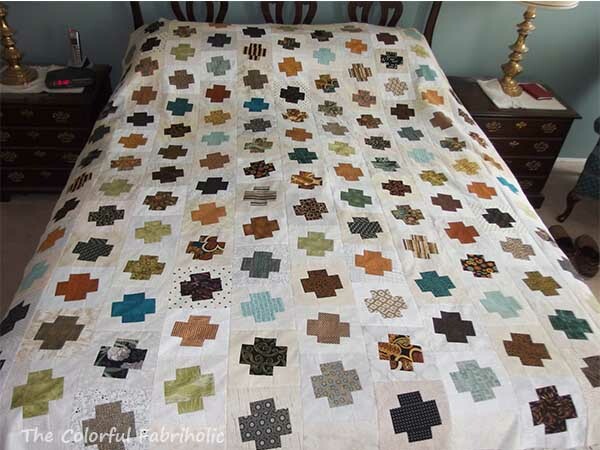 I was able to preserve the points even though they go all the way to the edge of the quilt, without adding a surround border. This little quilt finishes at about 36 x 45". Gotta love that stripey binding! The back is a pale aqua print I got at the fabric swap. 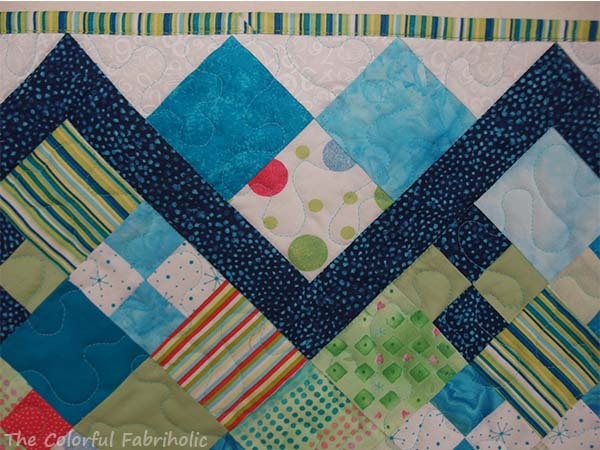 I like how the SID quilting around the blue border gives the back a border too. 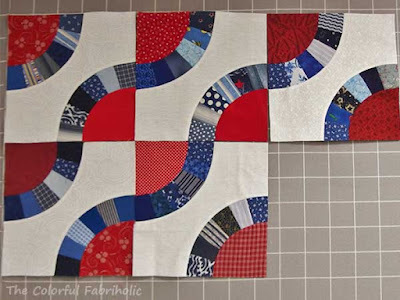 Once I finished the Boomerang Patches flimsy I couldn't move on to quilting it because I didn't have enough of anything suitable in my stash for backing, not even enough to piece together. So I set it aside and hoped to get something at the guild fabric exchange. 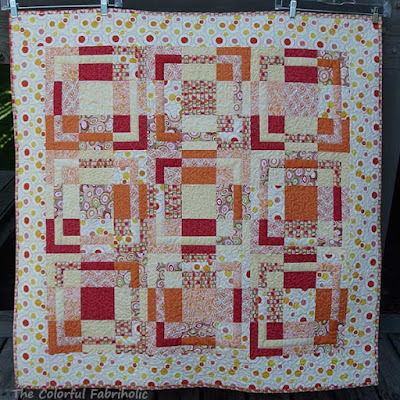 Meanwhile I pulled out a UFO, a small top I had pieced at a sew day using FQs from a STLMQG fabric swap/challenge. 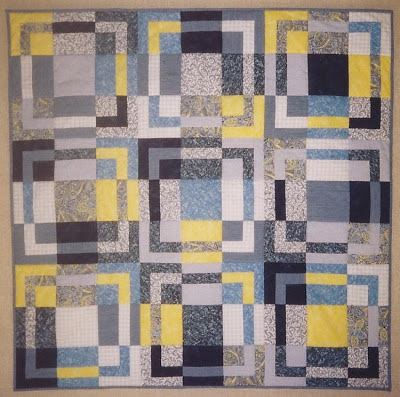 This was always intended to be a donation quilt. 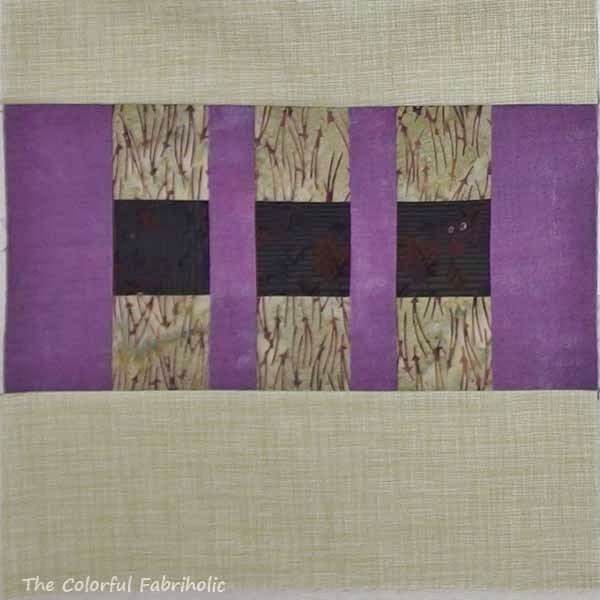 I found suitable fabrics in my stash to piece together a backing. 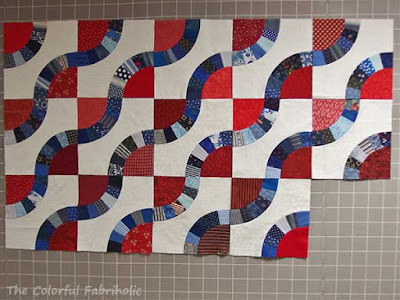 I quilted it with an allover meander. The binding is prepped. 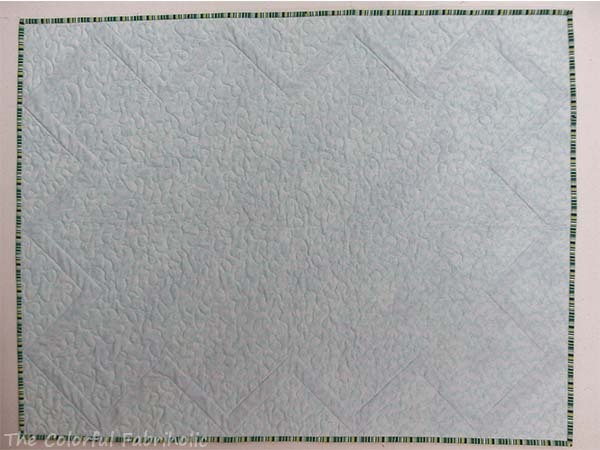 Hopefully I'll get this little quilt (45") bound and finished this week. Unfortunately it's too small for any of the Hands2Help charities, but I'll find a local place to donate it. 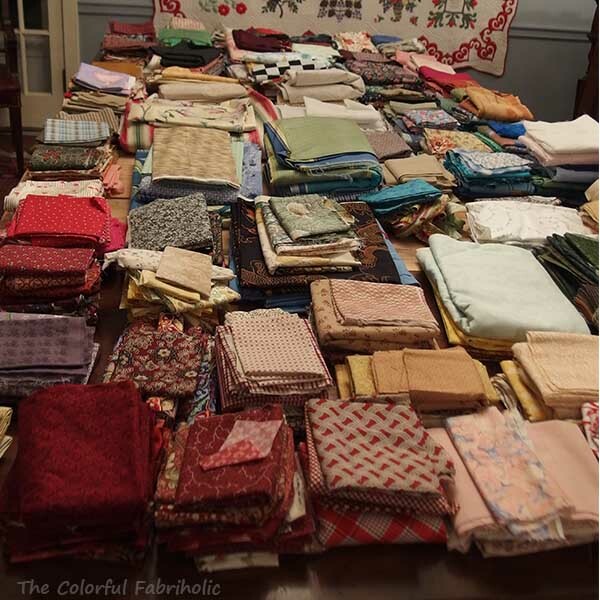 Last night my guild held our annual Fabric Swap social meeting, always a fun event. The way it works is, you bring whatever you want to de-stash, and you take home whatever you want. This year's fabric swap was special because it included the stash of our late friend Kathleen, who had a deep stash and excellent taste. Two dining tables, three card tables, a folding table, and a credenza were all filled like this. Everyone circulated and took whatever they wanted, and everyone came away a) satisfied, and b) taking home more than they swore they would. I don't know how many times I heard "Oh, I really don't need anything, but..." as someone picked up yet another piece of fabric. I de-stashed 16-3/8 yards, some of which was promptly snarfed up by a couple of close friends. I was specifically looking to get backing for my Boomerang Patches baby quilt - I even took swatches with me for color. I restrained myself - I really did. 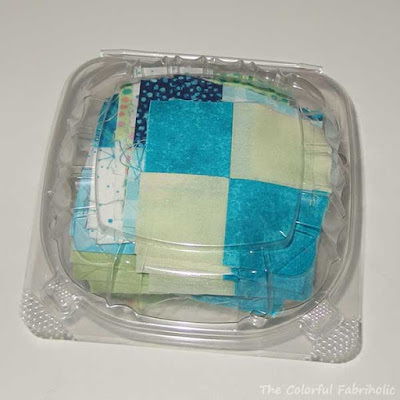 I found the perfect light aqua for backing and there's enough I won't have to piece it. I should have stopped there, but a few other pieces called my name. I haven't counted the yardage yet, but I'm sure there's quite a bit. There's a 4-yard piece of navy print that would work for backing for a QOV. 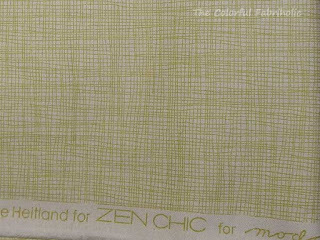 A 1-1/2 yard piece of pastel print, good for backing for a donation quilt. And a bunch of smaller pieces, just because I liked them, no specific purpose in mind. Any fabric that was left over, and there's always some, goes to Charity Sharity where it's used by charitable groups. The only things remaining at the hostess's house were threads, lint, empty tables, and leftover desserts. Best of all it was a fun evening with my friends, a social event we look forward to every year. So I'm sharing this story at Let's Bee Social at Sew Fresh Quilts today. 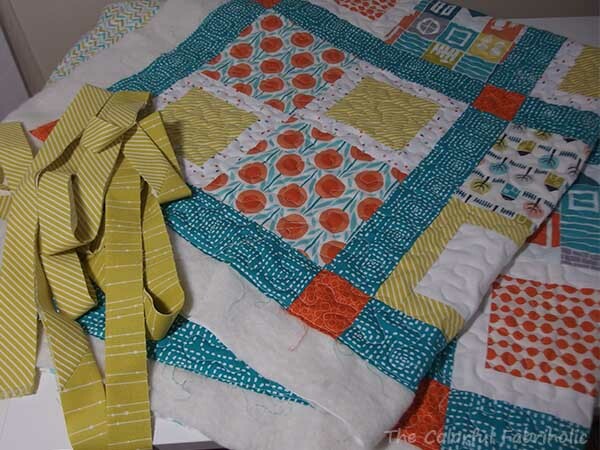 Lower left: the Boomerang Patches baby quilt is a finished flimsy. I staystitched around it but didn't trim the extra points off; I'll cut them off after quilting. 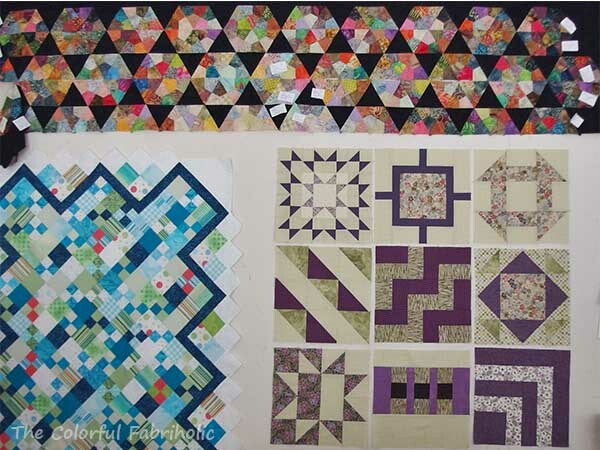 Lower right: Solstice Challenge blocks. Again, I put my own spin on some of them. 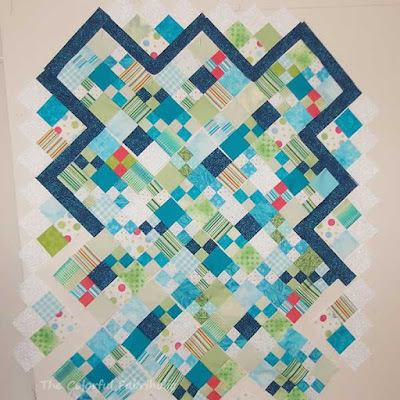 I again chose to feature a print instead of appliqueing hearts for week 8, and I've kept all my blocks 12" instead of making any of them larger. Across the top is my WIVSP*. 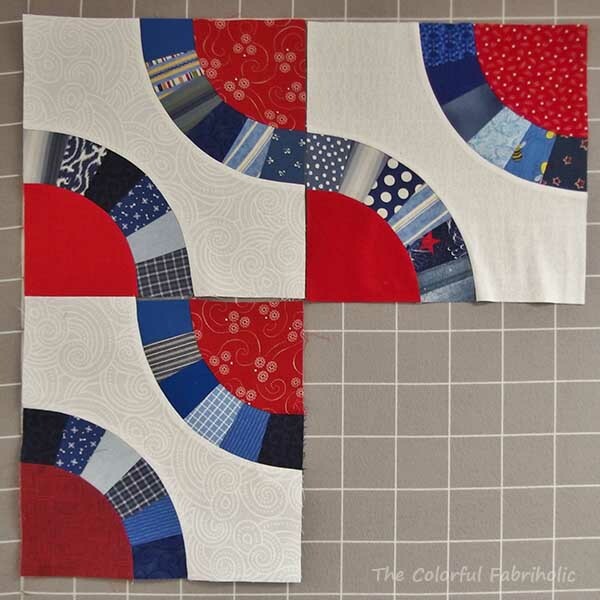 I'm working on pressing all the seams in the sections that my friends returned to me after Piecing Group. The pressing is slow going; I'm spinning the seams where all the triangles meet and wrangling all this is a slow process. Not to mention a bit hot on the fingers! Better to do it now than to wait until the sections are too large to handle. But it sure is boring. This is how projects become UFOs. But I have too much into this one to let it become a UFO. Too many friends have helped me work on it and I owe it to them to finish it, and besides, I still think it's pretty cool even after all these years so I want to see it finished. So I'll keep plugging away at the pressing. IN this month, 3/8 yard white-on-white for more snake blocks. 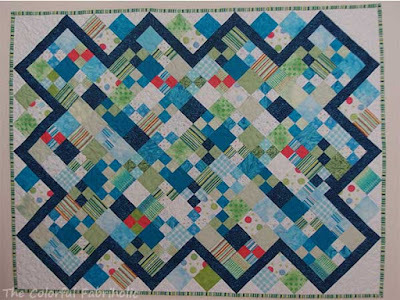 OUT this month: 1/2 yard for the baby quilt top, used for supplemental patches and borders. I'm not counting the boomerang patches. The stash ins and outs will change tomorrow. My guild is having our annual fabric swap. I've pulled some no-longer-loved and/or already used selections, and I'm hoping to come home with something I can use for the backing of the baby quilt. 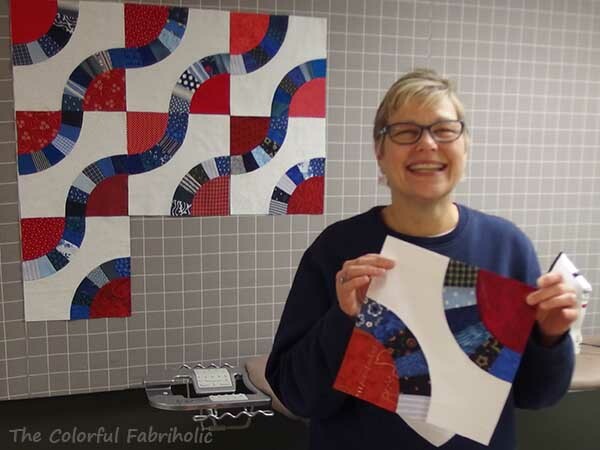 A few months ago I gave a trunk show at Tea's guild, and I showed my Framed Nine Patch quilts as well as my Cut and Shuffle Quilts from my book. Tea - of TeaQuilts - leads a Scrap Club and she chose my Framed Nine Patch for her group to make. She used my tutorial, then she made a video to show them how she made her version. 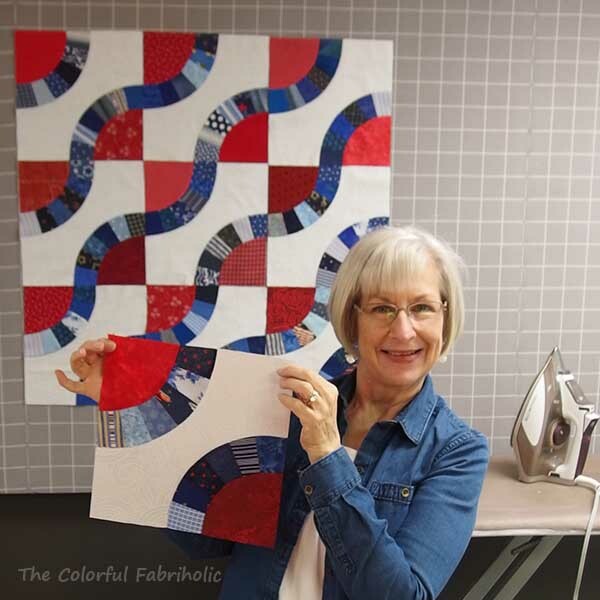 Tea does a wonderful job of explaining her fabric and color choices, and I love her palette and how her fabrics work together. 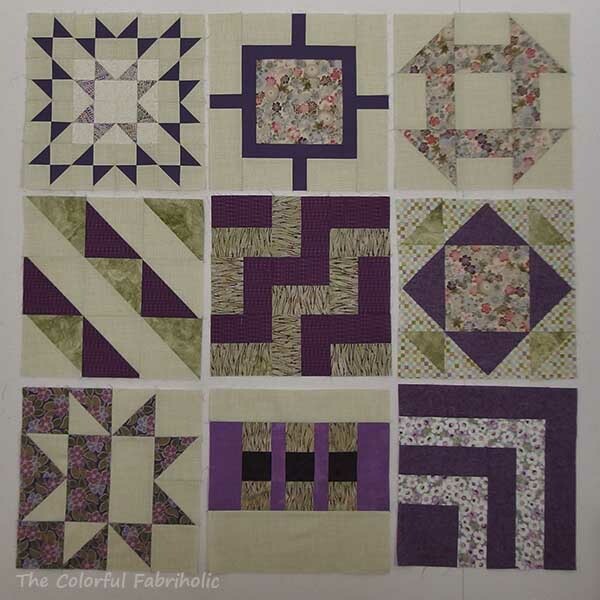 She also adds tips for managing seam allowances, and for arranging blocks without a design wall. I highly recommend you check out her video. Here's a screen capture from the video of her blocks all laid out. She made her version a little bigger, using 13 FQs for a 3 x 4 block layout, 36" x 48". My friend Cherie of the Quilted Jonquil is a member of Tea's scrap club and she made a Framed Nine Patch, using her signature thrifted shirts. So cute! check it out here. My Framed Nine Patch tutorial is in two parts. 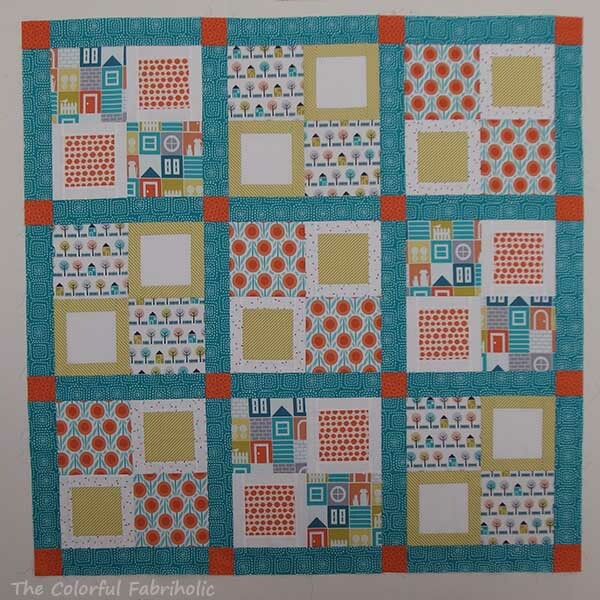 Part 1 here is all about fabric selection and making the starter framed squares. Part 2 here is about cutting the starter blocks, shuffling the parts, arranging them back together, and adding an optional border. In Tea's video she mentions my book, Cut and Shuffle Quilts. Thanks so much, Tea, for supporting a fellow quilter and promoting my book. The Framed Nine Patch was actually the precursor to the cut and shuffle concept. If you're interested in making parent blocks, cutting them up, shuffling the parts, and creating something totally new from the parts, check out the Cut and Shuffle Quilts tab above. If you're interested in purchasing a book, please leave me a comment. I rarely have more than one project at a time on my design wall, but today I have three. 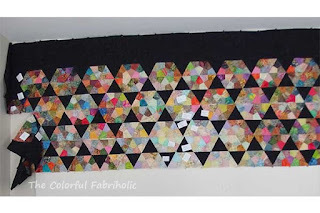 WIVSP, aka "How Many," my hand piecing project. 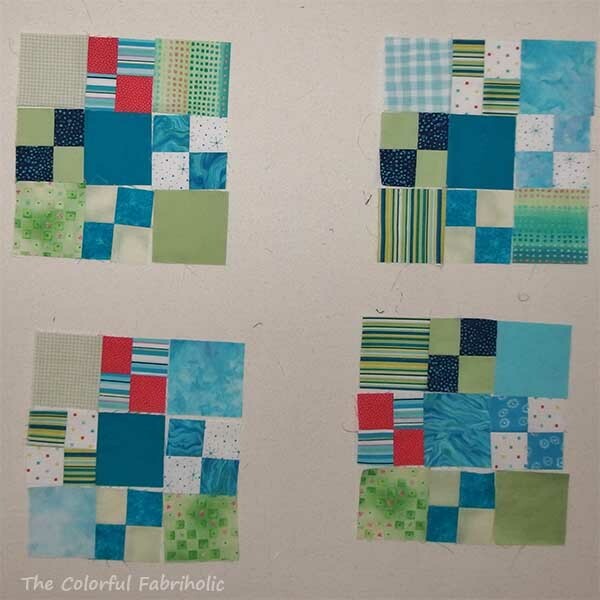 The top five rows are sewn together. The next two rows are sewn together, ready to be attached to the top part. 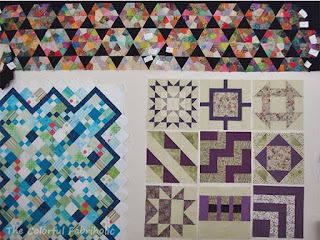 My Piecing Group friends returned the sections they recently worked on for me (like a bee), and now I'm getting the sections pressed and ready to lay out for joining together. This will be a queen sized quilt and it's been in work since about 2008, all hand sewn, thus the designation as a Work In Very Slow Progress. First Saturday blocks. A LQS is running a BOM series with an Emerald Isle theme. These are the first six main blocks, the first time I've put them all up on the wall to see how they look. There is also an optional alternate block each month. The alternate blocks also have the borders around them that create the diagonal chain effect. I haven't made them yet, although I have the kits. At the end of the series I'll decide if I want the alternate blocks as designed, or if I want to do something else instead. Boomerang Patches baby quilt top in progress. 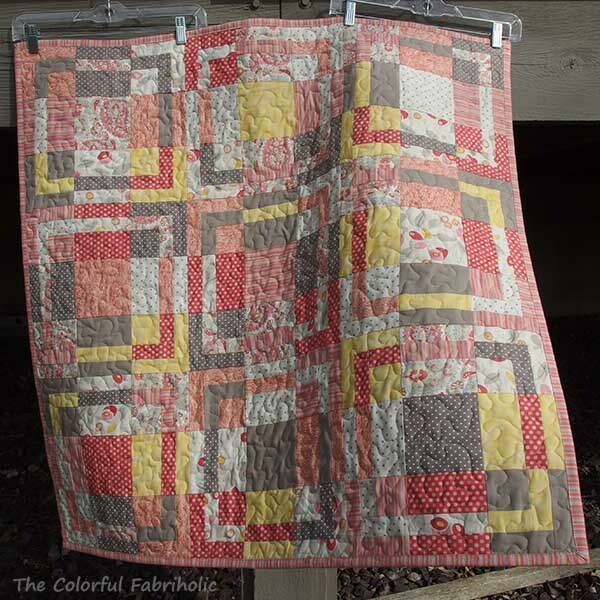 Those chevron borders required lots of partial seams, unsewing, and Y-seams. I need to trim the top to get rid of the excess points, then staystitch around the edges since it's on the bias and has lots of seams. It measures about 36 x 42. I'll find backing for it in my stash and quilt it myself. This week I need to figure out next steps and where I'm at on these projects and look at my goals for the month to see what else I need to work on. Lots of irons in the fire! 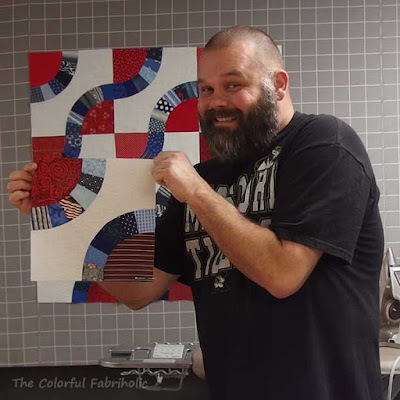 I was honored to be invited to sew with Kevin the Quilter and friends at his Quilt Cave last week. We had such a good time! 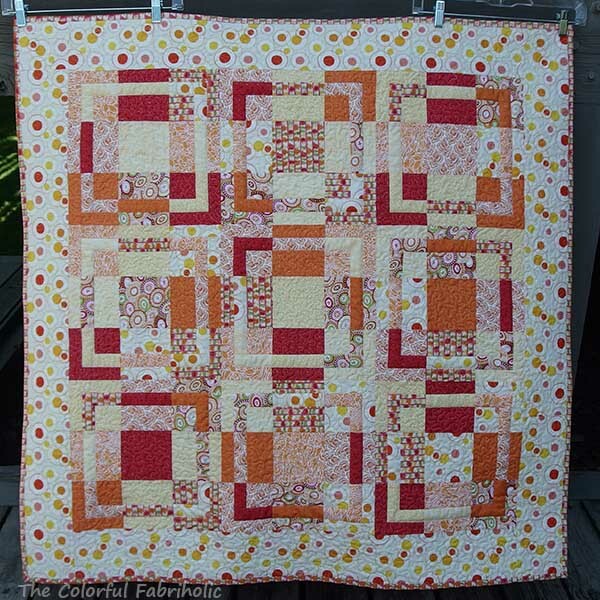 It all started when Cherie posted a photo of an antique quilt top and I drafted the block for her. Kevin invited Cherie (Quilted Jonquil), Dar (Dar's Patchwork Garden), and me to his Quilt Cave to use this block to make a Quilt of Valor. But first we had to visit the chickens and see the newly hatched baby chicks. So soft and so cute!!! At that point I hadn't unpacked my camera yet, so unfortunately no photos. We gathered in Kevin's wonderful studio, large and very comfortable for four of us with ample room to spread out, multiple cutting stations, excellent lighting, and a giant design wall. Kevin, you rock! 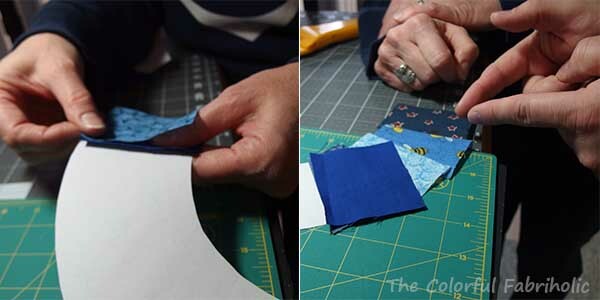 We started by cutting with templates, then paper piecing the arcs. Cherie gave a refresher lesson on paper piecing. I'm so glad; her advice helped me tremendously. 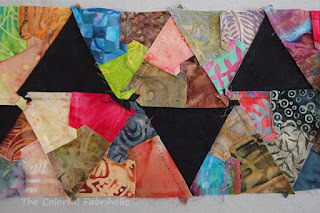 I don't love paper piecing and I had to rip out more than I cared to when I made the original test block. Cherie explained how and where to start, which side up/down, and how to align the next piece. Thanks, Cherie! By lunchtime we had 5 blocks done, but it was becoming apparent that I couldn't keep up, sewing all the curved seams, with how quickly the arcs were piling up. Kevin served a beautifully presented and delicious salmon salad. Check out his blog, I hope he posts a picture of it. It was definitely impressive. After lunch I showed everyone how to sew the curved seams and get them to align correctly at the start and the end without going wonky. (Since I was demonstrating, I didn't take photos, so I'll have to get someone to help me and I'll post a tutorial later.) Eventually - with some muttering, etc. - each of us completed a block. Congrats on those curved seams, Kevin! We weren't having any fun and we didn't laugh at all, all day. Not. By the end of the day we had completed 14 blocks. I didn't think we'd get nearly this many blocks done. And we had such a good time! 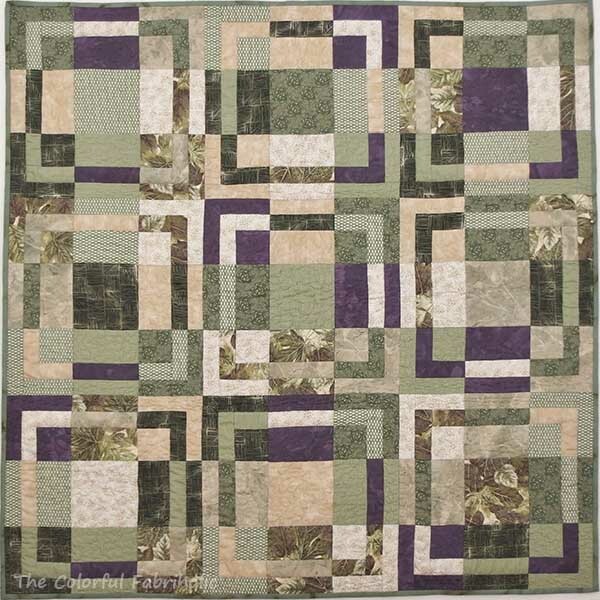 You can see why this is called a snake quilt. We like the scrappy variety of fabrics, especially the blues. It's pretty amazing what four people can come up with together, just from stash. There's even a few patches in there from recycled shirts. I like that there's a lot of value contrast within the blue arcs, which kind of makes them sparkle. At first I thought all dark blues would be better, but the variety is much more interesting. We've decided to get together periodically and sew until we get enough blocks done for a QOV. 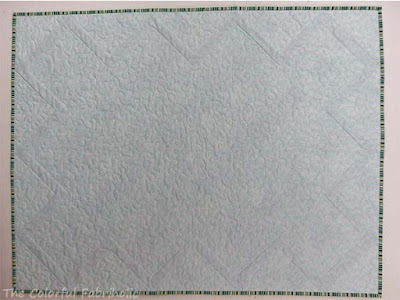 Since the blocks are 10" and we want the quilt to be 60" x 80", we need a 6 x 8 layout or 48 blocks. Thank you, Kevin, for inviting us, for being such a great host, for the magnificent lunch, and for such a good time together. 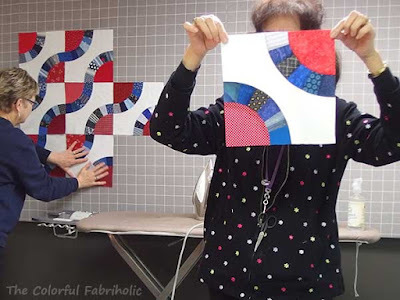 It's so much fun to get together with others who share my love of quilting, do what we love all day, laugh and chat while we're doing it, and end up with such a worthwhile project. I'm so looking forward to our next get-together. And I've promised myself that in the meantime I will master paper piecing these arcs; my goal is to achieve at least one without having to unsew anything. Since this was a social sewing event, I'm linking up with Let's Bee Social at Sew Fresh Quilts. Awhile back I mentioned that I had "adopted" some little 4-patches and swatches at my guild's orphan adoption event. Then I discovered that they were leftover bits from a project of my own from about ten years ago, that I had donated to a previous guild event. 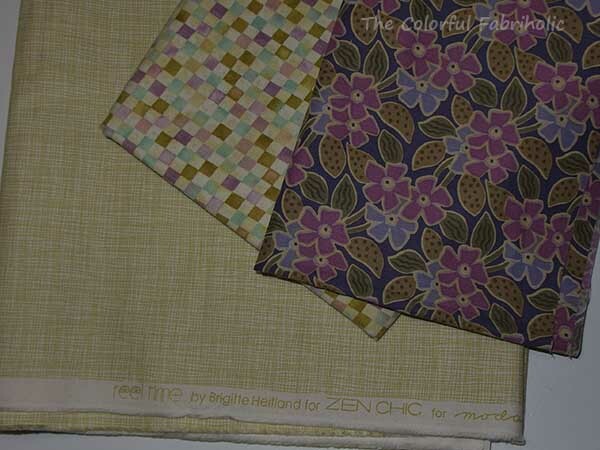 I still liked the colors, and I even still have some of these fabrics in my stash. During my recent studio clean-up, I debated putting the box of patches away somewhere, or just using them right away. I ended up sewing them into nine-patches. An on-point setting seems to be working. 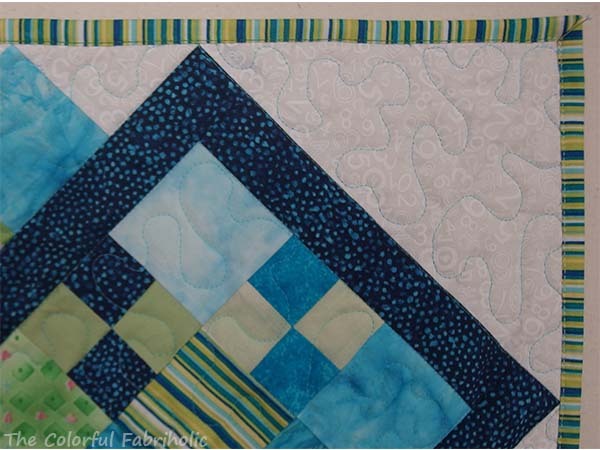 I added a green/blue stripe and some white-on-white to supplement the existing patches, so that I could use more of the white in the border and the stripe for the binding. 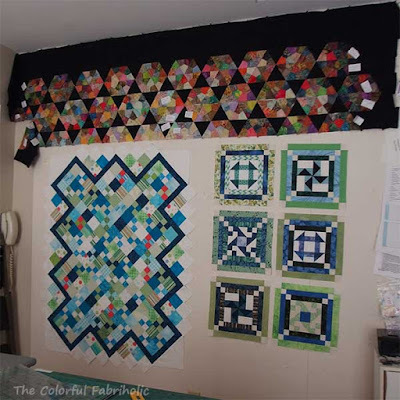 For setting triangles, I'm piecing together a few patches and framing them with a strip of that speckled dark blue, which is making a chevron border. I'll fill in the corners with the white-on-white. The cut strips of dark blue look a little heavy here, but they will finish the same width as the tiny four-patch squares, 1-1/4 inches. My friend Cherie donated the box of patches to the orphan adoption event. Our late friend Darlene had adopted the patches years ago when I donated them and had started a baby quilt out of them. 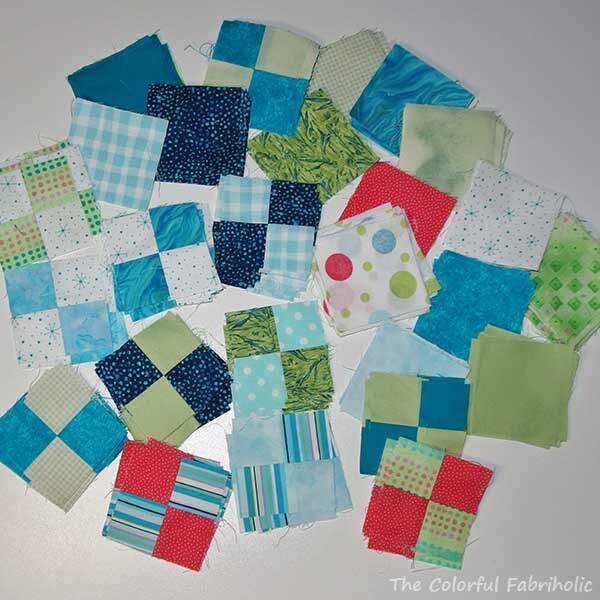 Cherie helped Darlene's husband to deal with Darlene's stash, and ended up taking the baby quilt WIP and the extra patches. She'll finish Darlene's baby quilt, and she challenged me to see who finishes first, or maybe we can both finish them and show them at guild show & tell at the same time. So one of my goals this month is to get these Boomerang Patches sewn into a flimsy and off the design wall. I may have gotten a little sidetracked in January. Or maybe derailed is a better description. Anyway, with the new year I found myself starting some unplanned new projects. Let's check out the state of the stash and then regroup with the goals. It's nice to be in the black so far. 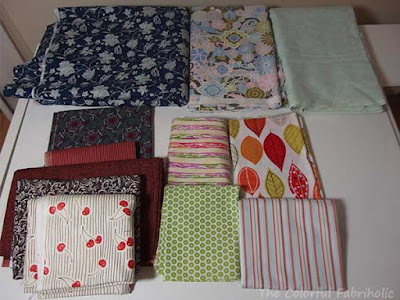 In February my guild has our annual fabric swap and I'm sure I'll pick up some new-to-me fabrics there. I'll take some no-longer-loved pieces to destash, too, so hopefully I'll break even from the event. 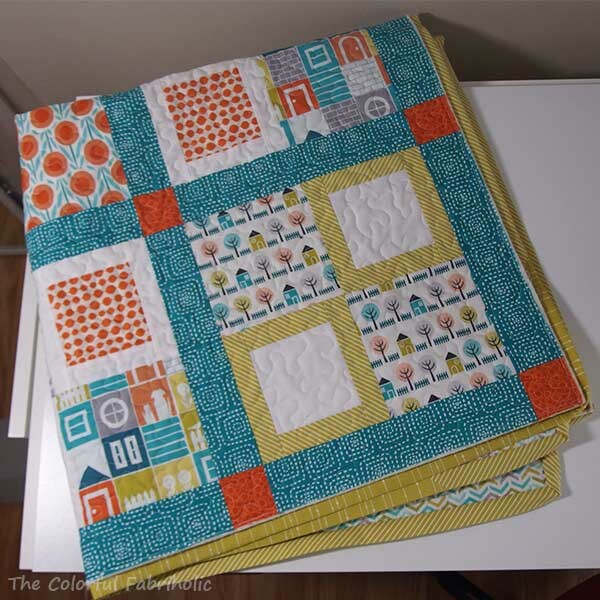 My biggest purchase in January (other than the FQ sale) was pale green background for my Pat Sloan Solstice Challenge blocks, shown here with some older stash fabrics I'm using in the blocks. Did I mention I got sidetracked? While I didn't work on a WIP or UFO, I did get a lot done, but I also started projects so now I have a few more WIPS. I think I'll have to stay more focused in February. 4. Keep up with bee blocks. DONE. I even managed quite a bit (for me) of hand sewing on my Piecing Group project. I'll show more after the group meets here on the 7th. 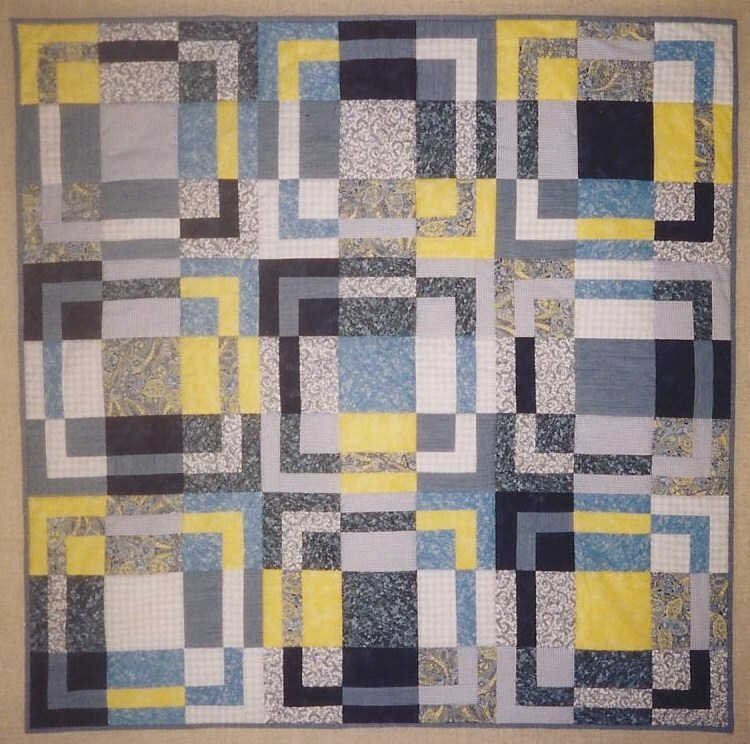 Planned & started baby quilt using Boomerang Patches. I'll show it on my design wall tomorrow. OK, that's a lot of smaller projects, or small portions of larger ones, that I can bounce around among in February. Let's see if I can stay focused on just these and not start anything new. Wish me luck! 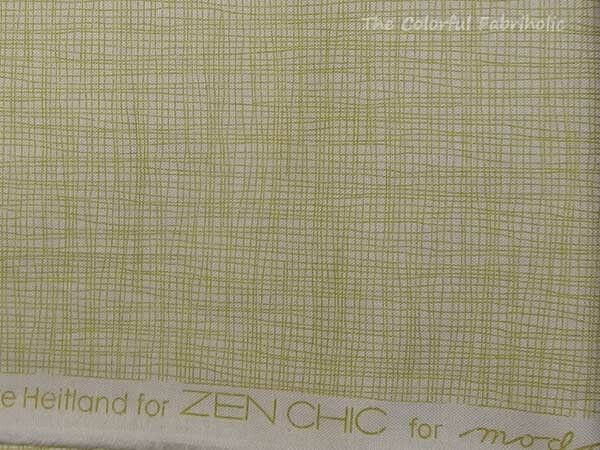 Last week I invested in a pale yellow-green crosshatch print for background for my Pat Sloan Solstice Challenge project. It turned out to be perfect. And I remade the blocks from weeks 1 and 2 using it for the background. I think I'll be much happier with this than I was with the beige I had been using. So far I've been able to keep up with the challenge, but since I've spent time on this project, I neglected to work on a UFO in January. And now I have this new WIP. I think I'll have to be a lot more disciplined in February about sticking to my goals.